Removes dead hair from undercoat and top coat. 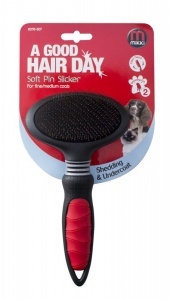 Helps brush out minor knots and tangles. The flexible head gives a more gentle experience for you and your pet. Curved back for natural action. Specially firmed pins.